Hover (with your mouse) or click (on your phone) different areas of the RigLock® to learn more. 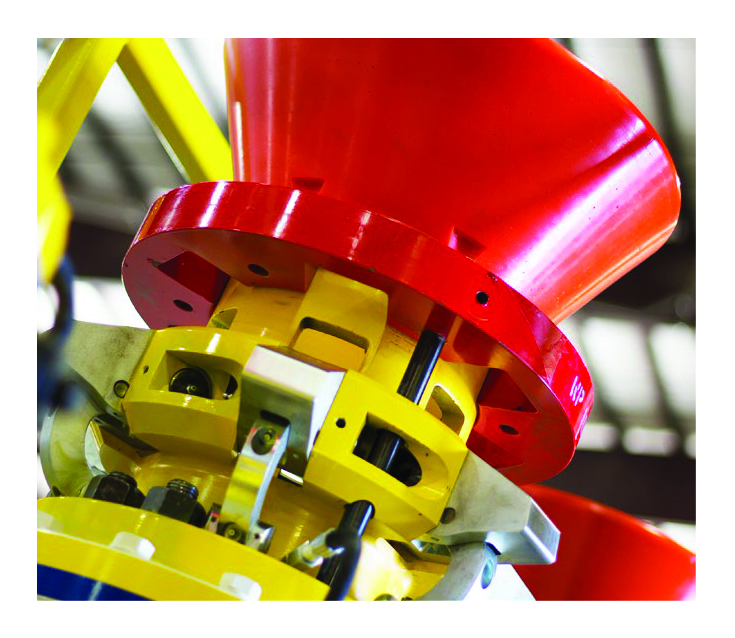 Contains pressure and keeps foreign material out of the frac tree between stages. Oversized highly visible entry guide. This allows the crane operator to quickly spot the sub going into RigLock®u2122 from distances of over hundred feet, ensuring proper equipment placement. RigLock®u2122 speeds up all well work with quickly connecting and disconnecting. Mechanical Locking Ring secures the cams. The locking ring goes over top the cams giving us a secondary lock and thus ensuring the integrity of the connection even during possible loss of hydraulic power. Cam locks secures equipment connection. The patented design uses a series of 6 cams to seat the sub, establish a secure connection, and to allow the locking ring to come over the top of it, thus sealing RigLock®u2122 to the wellhead. Manifold to test integrity of connection. The quick test sub portion of the RigLock®u2122 body enables you to test the connection from the control unit on the ground before well pressure is introduced to RigLock®u2122. Hydraulic quickly connects to RigLock®u2122 so that we can quickly make the connections to function the cams the locking rings and the quick test sub. Remote hydraulic actuation keeps technicians away from possible collision or crushing injuries. Integrated 2 inch 1502 pump-in sub. This allows for equalization and to pump into the lubricator from below RigLock®u2122. Flange connection to the wellhead. These flanges come in different orientations and sizes so that you can easily install RigLock®u2122 on any well head. This allows the crane operator to quickly spot the sub going into RigLock® from distances of over hundred feet, ensuring proper equipment placement. RigLock® speeds up all well work with quickly connecting and disconnecting. The patented design uses a series of 6 cams to both seat the sub, secure a good connection, and to allow the locking ring to come over the top of it, thus sealing RigLock® to the wellhead. 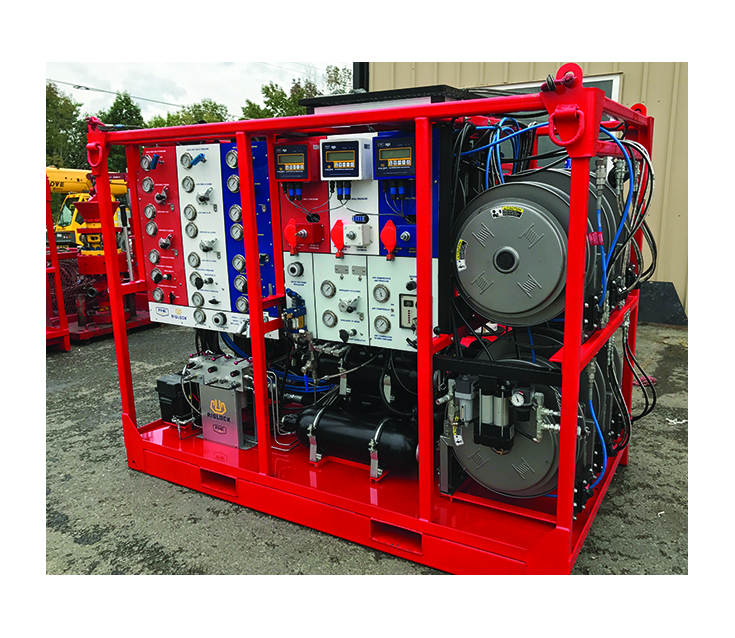 The quick test sub portion of the RigLock® body enables you to test the connection from the control unit on the ground before well pressure is introduced to RigLock®. Hydraulic quickly connects to RigLock® so that we can quickly make the connections to function the cams the locking rings and the quick test sub. Remote hydraulic actuation keeps technicians away from possible collision or crushing injuries. These flanges come in different orientations and sizes so that you can easily install RigLock® on any well head. 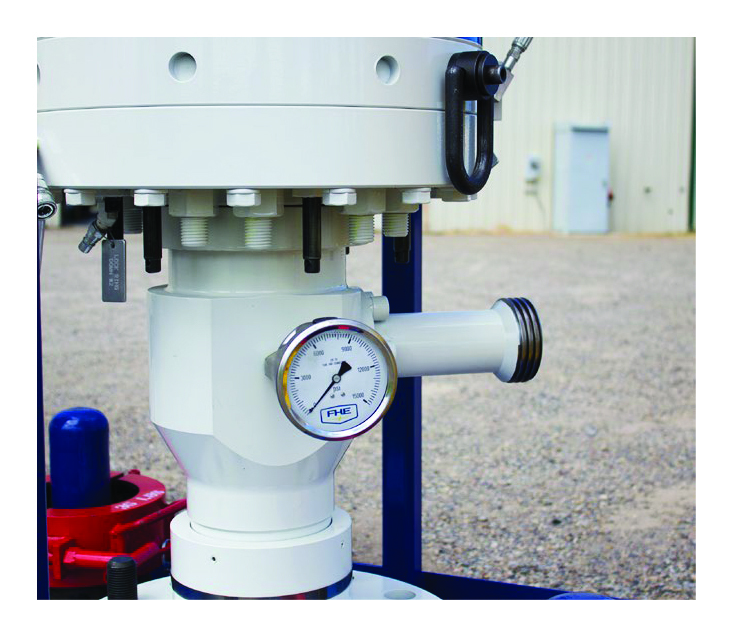 This allows for equalization and to pump into the lubricator from below RigLock®. Nightcap keeps foreign material out of the frac tree between stages. The 10,000 psi working and the 12,500 psi working function the same: they have the same ids. The difference is the 10K is H2S rated so we use a steel that is NACE-approved for hydrogen sulfate. On the 12,500 it is for higher pressure but it is for standard service only not for H2S service. Primary cam locks secure the connection and are locked out with a secondary ring. 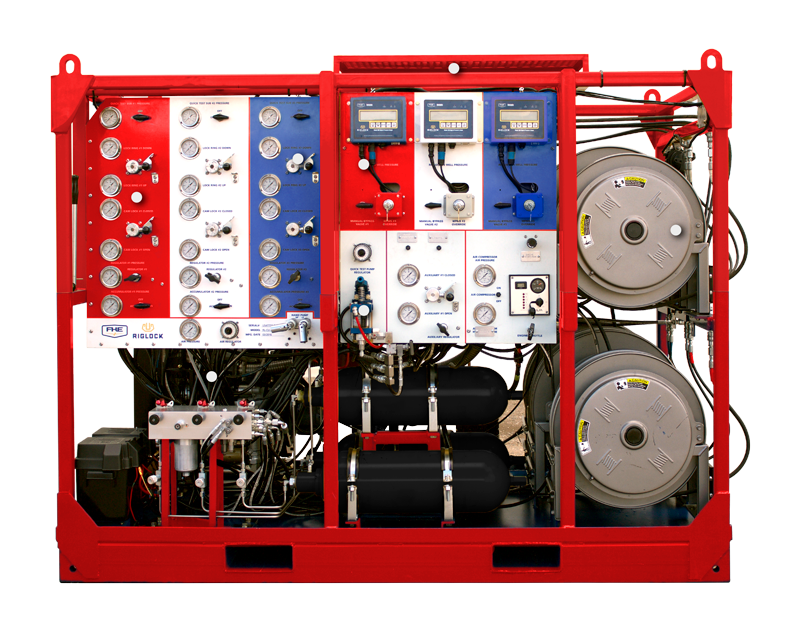 RigLock® systems are controlled with a custom-designed hydraulic control unit. 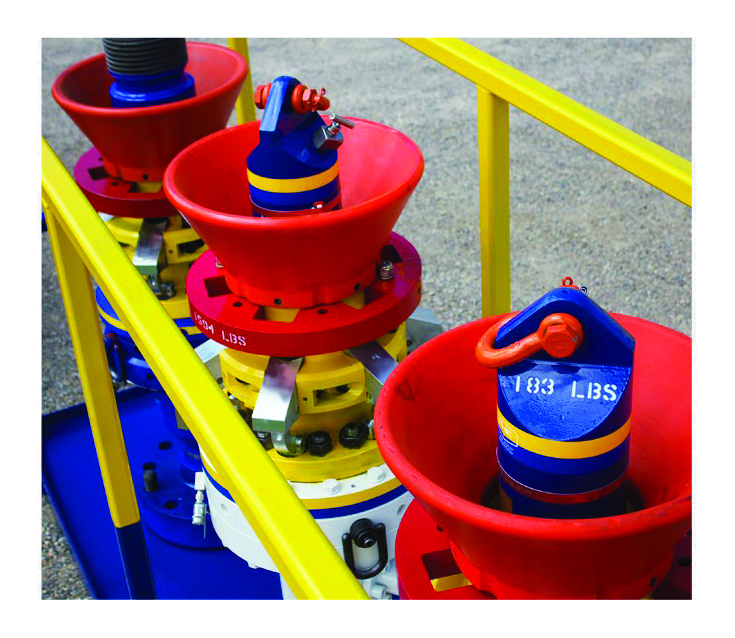 Speed up your wireline operations by using multiple RigLock® packages on the same well pad. 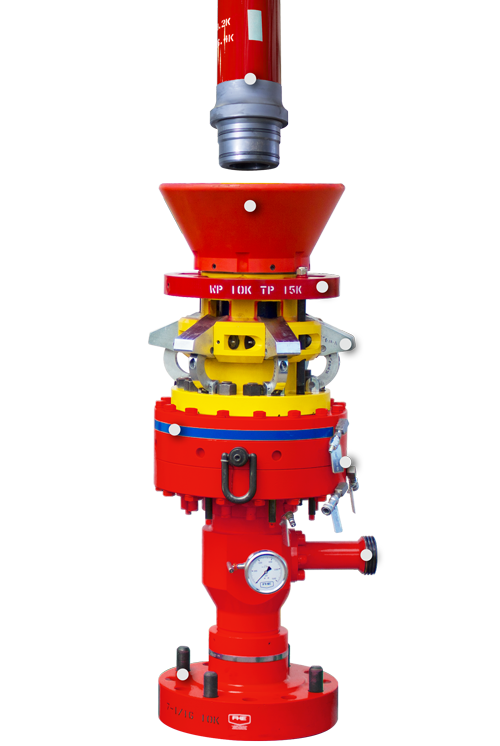 RigLock® integrates a 2” 1502 pump-in sub port to deliver helpful additives. 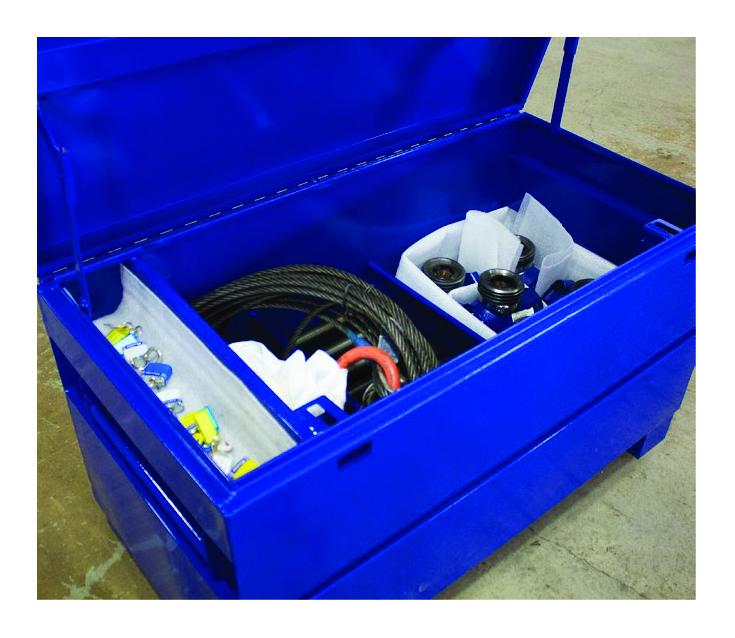 All the necessary accessories are stored conveniently in RigLock® toolbox. An integrated manifold allows you to verify the integrity of the released connection.